Looks like this f-14, might be something else though. It's a F15, there's a good photo of it on flitetest instergram page from 4 days ago. Why isn't there a youtube video out on this yet?! I'd love to see this! That's a F-15 built by Splinter189 you can find his build thread here. 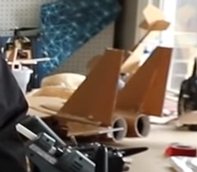 I dont know if FT will release it or he will, i noticed the new F4U shares his design techniques so maybe he is partnering with them. He was also in the flying tank video. No problem. Funny thing, he made a F-14 also the build thread is here. He builds awesome jets and is going to release the plans at some point. Speechless! That F14 is the most awesome rc I've ever seen... No exaggeration. Oh yeah, that looks like John and his designs. He posts over on the FT Fans group on Facebook. Pretty cool stuff, he's gotten really passionate about it and everything. I don't know of any official confirmations but I know Josh Bixler say he'd like to meet up with him sometime. And I know John was there to help them load stuff for the flying tank video. I remember John saying that plans would be released, but like @JTarmstr said, not sure if FT will do it or if he will. Either way it's a great looking plane. I saw his build thread on it and when I saw it in the background I freaked.